Wolfpack Pays is a 5 reel, 243 ways to win video slot from NextGen Gaming – available to play across compatible desktop, mobile and tablet devices from 40p to £80 per spin, it has a mystical theme with an eerie yet epic soundtrack. It also uses a unique feature. Visually stunning and set against a beautiful and wilderness backdrop, it feels American Indian – symbols on the reels include howling wolves in the moonlight and eagles. 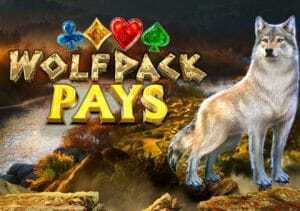 The wolf is the wild symbol and rewards you with 800 times your line stake if you manage to get 5 across a payline. Wolfpack Pays uses the On a Roll feature where any win grants you a free re-spin – more importantly, Wolf Wilds are added at the start of each free re-spin to enhance your winning potential. After 1 winning spin, wilds only appear on the middle reel. After 2 winning spins, they will appear on reels 2, 3 and 4. After 3 winning spins, wilds can make an appearance on all reels. If you’re lucky enough to get 4 consecutive winning spins, you will activate the Wolfpack feature. Now, a further 5 Wolf Wilds are added during this feature – you will carry on getting free spins until 3 Paw Tokens disappear from the meter above the reels. A paw token only disappears when you don’t have a winning spin meaning this game rewards you handsomely for consecutive winning spins. Once you start playing, you will see how simple Wolfpack Pays really is – I’ve managed to get over 15 free spins in the Wolfpack feature which led to a huge 720 times stake win. I found it to be a medium to high variance game where 4 or more Wolf Wilds on a free spin can get you howling. Unfortunately, you need to be patient as you’ll most probably win under 20 times your stake. If you like the theme, IGT’s Wild Wolf is recommended. If it’s volatility you’re after, 300 Shields by NextGen Gaming is your best bet.